Brooksville City Hall is located at 201 Howell Avenue, Brooksville, FL 34601; phone: 352-54--3810. Photo: William Sherman Jennings House, ca. 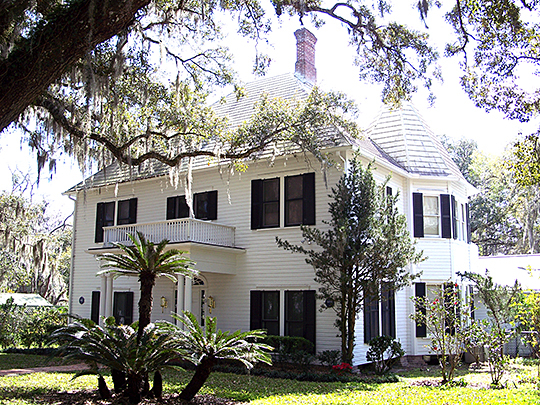 1888, 48 Olive Street, Brooksville, FL. Listed on the National Register of Historic Places in 1998. Photographed by User:Ebyabe (own work), 2007, [cc-by-3.0 (creativecommons.org/licenses/by/3.0)], via Wikimedia Commons, accessed January, 2013. Fort DeSoto was established in 1840 and a community known as Melendez was settled about 5 years later. Brooksville was established in 1856, established from these two places. It was incorporated in 1880. Four pioneer families played prominent roles in the early days of Brooksville: the Howells, the Mays, the Hales and the Parsons. The City is sited among rolling hills about 15 miles east of the Gulf of Mexico and about 45 miles north of Tampa. History of Brooksville, www.ci.brooksville.fl.us, accessed January, 2013.